I was reading Harrison's post below and it reminded me of the person this past Sunday morning who asked if someone in the church had died. Really, not a terrible question because while we have a life-sized cardboard cutout of Elvis we could not, despite our best efforts, find a full sized cutout or fathead of Tupac. This led us to "invest" in a giant poster of tupac's head that we placed upon a tripod on the stage. So far this is not a problem, but we then placed candles on the stage to set the mood a little bit right in front of the poster... Nooowwwww we had a memorial on our hands. Ha! But in the end I think everyone was glad that we're doing it. 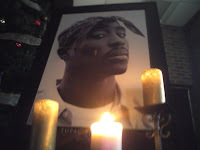 Not the memorial, per se, but definitely the Jesus, Tupac, & Elvis series. Let's be honest, it's a bit of a gamble to do that as our Christmas series. But yesterday was truly incredible. If you've got a friend who you wish could hear a crystal clear, engaging presentation of the gospel this would be a great weekend to bring them. Maybe even to get them ready for Christmas Eve.